I'm convinced the best things in life are free. Grace, sunshine, a thoughtful gift -- they make you feel happy and loved and don't cost a penny. 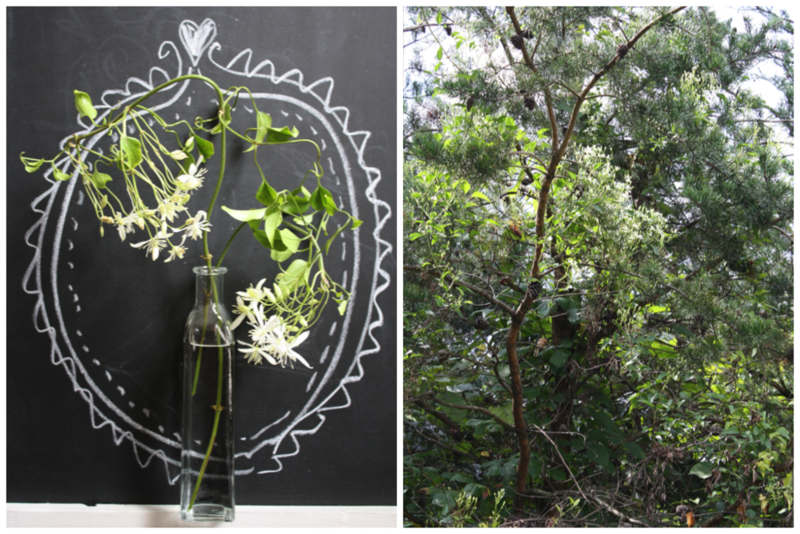 I got grace, sunshine AND a thoughtful gift when I discovered this awesome vine in the pine tree in our yard! I had just gotten back from the flower market, buckets of blooms and bush in hand. I ran in the house, sat down all the flowers and ran for my clippers. Unable to reach these beauties on my own (measuring in at 5 feet, 3 inches I don't know what made me think I could possibly reach them on my own), I called for reinforcement in the form of Jesse (my husband! ), an enormous pair of shrubbery trimmers and a "hook" (also known as an expandable wreath holder - hey, use what you've got!). As you can see, we managed. All day long I jabbered about how much I loved "those white flowers." Upon further research, I learned they are Western White Clematis. They fall into one of my favorite plant families -- Ranunculaceae/Buttercup. This family is also home to the anemone and ranunculus, two flowers that made an appearance in my bridal bouquet. They grow heavily in the western states, but somehow this one managed to make it here - just for me. And that makes it even more special. The Lord knows us, and He knew this would be the perfect gift for me. It reminds me of His grace and it all happened on a sunny day. Sha-zam!